For Kimble’s Food by Design, freshly made food isn’t just for the fresh food machine or the manual cafeteria. The company’s passion for producing great food also extends to the candy and snack category, offering refreshment service operators a chance to offer customers a great tasting snack for vending machines and micro markets. 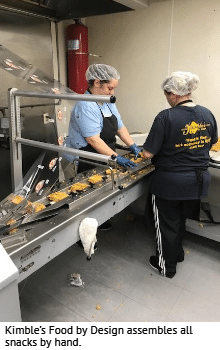 Launched in 1985 as a three-person vending operation in LaGrange, Ga., Kimble’s Food by Design has expanded to a full-service food operation that is becoming known nationwide for its Ole School Cornflake Chewy and Ole Honey snacks. The story began in 1985 when Kimble Carter, a short order cook in a biscuit shop, started a small vending business in LaGrange, Ga., servicing accounts from his car, assisted by his wife, Debra, and one employee. He rented a basement office in a paint store in nearby Columbus. The company expanded slowly, and in the late 1990s, a local hotel asked Carter to cater their events, leading to the birth of Kimble’s Events by Design. Shortly after, the company expanded into manual feeding. By 2010, the company opened a commissary to make fresh food for its food vending machines. The commissary currently produces between 3,000 to 5,000 food items daily for its five vending routes. In addition to the 6-week rotating menu for the vending division, the commissary also produces food for the catering division. In 2010, the company began its candy division to make better use of the commissary’s labor during slow periods, according to Shannah Kuhn, candy division manager. “When the economy went lower, the commissary division wasn’t doing as well,” she said. Kimble also decided it made sense to produce food for its rapidly growing correctional division. Kimble used one of his grandmother’s recipes for a cornflake treat using cornflakes and peanut butter syrup which they called Ole School Cornflake Chewy. They initially produced 5,000 pieces a week for the corrections division, which now services 100 prisons throughout the Southeast. They soon began selling it to local gas stations. The candy division currently produces and packages about 15,000 pieces per day, Kuhn said. The only automated process is the wrapping. “We still make everything hand made,” she said. Kimble’s Food by Design recently teamed with Burdette Beckmann Inc. to introduce the candy to vending and micro markets. The brand is currently available in 13 Vistar warehouses as well as H.T. Hackney Co., a grocery distributor, and Stacy Williams Co., a food distributor. In October, the company introduced its honey toasted oats, Ole Honey, which is similar to a Cheerio, Kuhn said. The Ole School Cornflake Chewy and Ole Honey both come in two single-serve sizes. The larger size versions go in the pastry shelf in a vending machine. The candy division has tripled in the last three years, Kuhn said, producing as much as 60,000 pieces a week with 10 employees. Kimble’s Food by Design is also marketing to convenience stores and grocery stores nationwide. The candy division is currently doing around $1.5 million in annual sales. The company, which has about 200 employees, has exhibited at the National Automatic Merchandising Association show and the Atlantic Coast Expo. The company’s five-route vending division services a 100-mile radius of LaGrange. Last year, the company opened a division called Kimble’s Skillet to operate prison kitchens.